Eviction | Undisputed Legal Inc. If your tenant still has not moved after the last day given in the Notice to Quit, you must return to the clerk’s office with the original Notice to Quit, the Process Servers Return of Service, and a completed Summons and Complaint. You will need to make 1 (one) original and a copy for each of the tenants/defendants. In addition, you should keep 1 (one) copy of everything for your records. Be sure to indicate in numbers 1 (one) and 3 (three) of either Complaint whether it is an oral or written week-to-week, month-to-month or year’s lease. This entry was posted in Eviction and tagged evict bad tenant, Evict Tenant, Eviction, Eviction Procedures, Eviction Process on December 19, 2018 by Customer Service. A tenant with a lease is protected from eviction during the lease period so long as the tenant does not violate any substantial provision of the lease or any local housing laws or codes. For both regulated and unreg- ulated apartments, landlords must give formal notice of their intention to obtain legal possession of the apartment. Unless the tenant vacates the premises by a specified date, the landlord may commence eviction proceedings through: (a) a summary non-pay- ment court proceeding to evict a tenant who fails to pay the agreed rent when due and to recover outstanding rent; or (b) a summary holdover proceeding for eviction if a tenant significantly violates a substantial obligation under the lease (such as using the premises for illegal pur- poses, or committing or permitting a nuisance) or stays beyond the lease term without permission (Real Property Actions and Proceedings Law (RPAPL § 711). This entry was posted in Eviction and tagged evict bad tenant, Eviction, Eviction Letter, Eviction Notice, Eviction Procedures, Eviction Process, New York Eviction on December 11, 2018 by Customer Service. The first step in the Summary Process (Eviction) procedure is the Notice to Quit Possession. The form you must use for the Notice to Quit, which the court will provide upon request, must be completed with the exact name and address, including the apartment number, floor number or other designation, if any, of each adult tenant you want to evict and must be signed by you as the plaintiff/landlord. There must be an original Notice to Quit Possession and sufficient additional copies for each tenant who lives there. You should also keep 1 (one) copy for your own records. You must state a reason on the Notice to Quit. The most frequently used reasons for evictions are non-payment of rent and termination of lease by lapse of time. Evictions for other reasons may be more complex. This entry was posted in Eviction and tagged Eviction, Eviction Form, Eviction Procedure, Eviction Process, Landlord Tenant Information, Notice To Quit on October 17, 2018 by Customer Service. Holdover Summary Proceeding – generally used to refer to any summary proceeding brought to evict on some basis other than for non-payment. Expiration or Termination of Lease – RPAPL §711(1) provides the fundamental authority for a holdover proceeding, and authorizes the maintenance of a summary eviction proceeding against a tenant who “continues in possession … after the expiration of his term without the permission of the landlord”. This applies to the tenant whose lease has expired by operation of law or because the lease has been terminated by operation of a conditional limitation in the lease. The terms of the lease control. The lease cannot be terminated for reasons other than those allowed under the lease (ie. No termination for “objectionable conduct” unless there is a provision in the lease authorizing such termination. See Perrotta, 98 AD2d 1, 469 NYS2d 504; Levesque, 106 Misc2d 432, 430 NYS2d 482). Rent / Use and Occupancy – Petitioner may seek rent for a period prior to the end of the tenancy and U&O for the period respondent “holds over”. The amount of U&O is set by the Court, but is generally set at the amount of the rent. This entry was posted in Eviction and tagged Eviction, Eviction forms, Eviction Notice, Eviction Process, Holdover Cases, New York Eviction, New York Eviction Laws on March 12, 2018 by Customer Service. Three Day Notice – RPAPL 711(2) requires petitioner to make a demand for rent prior to commencement of the eviction proceeding. The demand can be oral or written. If written, it must provide respondent with 3 days to pay the rent. The 3 day Notice must be served on the respondent and filed with the Court. The 3-day notice must state the amount of rent due and the period of time covered by that amount, together with a demand that the total amount be paid within 3 business days after service of the notice or tenant must give up possession. The date of service is excluded, as are Saturdays, Sundays and holidays. Petition must seek rent and not other charges – While petitioner can seek attorney’s fees (if agreed to in the lease) and Court costs, generally, respondent cannot be evicted for the failure to pay these costs, especially in a rent-regulated situation. This entry was posted in Eviction and tagged Eviction, Eviction forms, Eviction Laws, Eviction Process, Landlord Tenant Non Payment, Three Day Notice on March 8, 2018 by Customer Service. Tenants named in Housing Court hold- over and nonpayment proceedings end up on what is called the “tenant black- list.” The New York State Office of Court Administration (OCA) sells Housing Court data to tenant screening companies. These companies use this data to make reports about tenants. Landlords then use the reports to decide whether to rent to you. Most landlords will not rent to you if you have ever been in Housing Court. If your name appears in the Housing Court’s database, it can be difficult to find a new rental in New York City and other cities across the country. The OCA sells data about eviction cases brought in the New York City Housing Court to “tenant screening bureaus” (TSBs). This entry was posted in Eviction and tagged Eviction, Eviction Notice, Eviction Process, Eviction Service, Serve Eviction papers on March 1, 2018 by Customer Service. Personal Delivery: One copy of the notice of petition and petition may be given to you personally. If they are given to you personally, no other copies have to be served on you. Substituted Service: This kind of service takes two separate steps and must result in your being served with three copies of the notice of petition and petition. One copy must be given to a person of “suitable age and discretion” who lives or works at your home, not just someone who happens to be there (This person does not have to be an adult, but it should not be a small child). By the next day, excluding weekends and certain holidays, the two other copies must be mailed to you, one copy by regular and one copy by registered or certified mail. Certified mail does not require a return receipt, but you will probably have to sign for it. This entry was posted in Eviction and tagged Eviction, Eviction Process, Serve Eviction papers, Serve Legal Papers on February 19, 2018 by Customer Service. Eviction Records… Did You Know…. It is a myth that an eviction record can be used against an applicant forever. For info on our eviction services, visit us at www.undisputedlegal.com/services/eviction-services/. This entry was posted in Eviction and tagged Eviction on February 15, 2018 by Customer Service. This entry was posted in Eviction and tagged Eviction, Eviction Process, Eviction Tips on December 25, 2017 by Customer Service. 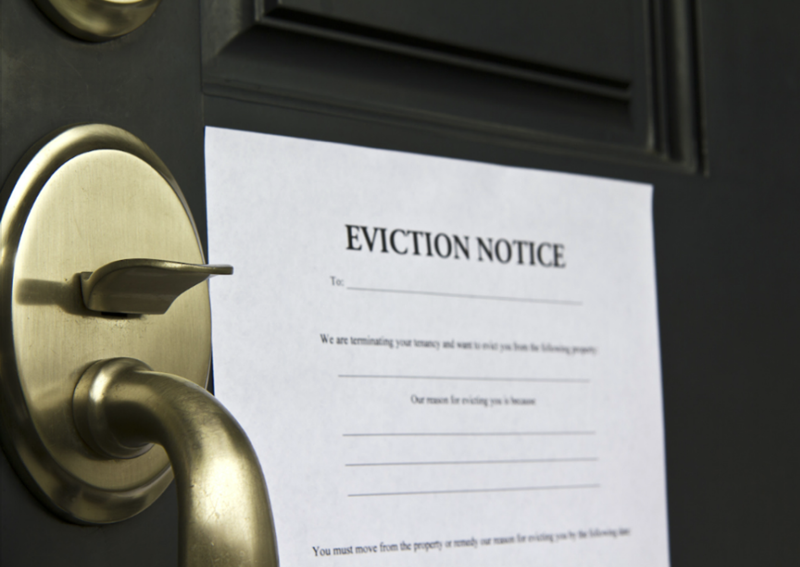 Evictions must follow a strict legal process. If a tenant isn’t paying rent or has repeatedly broken rules laid out in the code of conduct, the landlord has the right to begin the official eviction process. He can’t take the law into his own hands, though. It’s illegal in nearly all 50 United States for the landlord to lock out a tenant. The definition of a lockout includes changing locks, blocking entry into the rental unit, cutting off electricity or water, or any other method that prevents the tenant from normal use of the property. The good news for landlords in the United States is that the eviction process is one of the shortest legal proceedings on the books. In New York, for example, it’s possible to legally evict a tenant in as few as 30 – 60 days. This entry was posted in Eviction and tagged Evict Tenant, Eviction, Eviction Process on December 5, 2017 by Customer Service.